Rajrang presents wide range of Indian designer Bedsheets These Bedsheets are work of India's experienced craftsmen. A team of skilled craftsmen from different parts of India work tirelessly to carve out a variety of Bedsheets It can be used for decor and give an ethnic look to your living and bedroom area. You can easily fetch many compliments from your guests and relatives. These products are too easy to carry with hand wash. It must be more useful choice for change the interior. 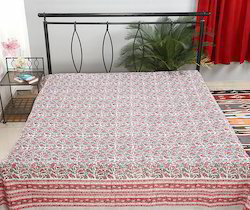 We are offering our customers an excellent quality range of Cotton Double Bed sheet Rajrang presents wide range of Indian designer Hand block print products. 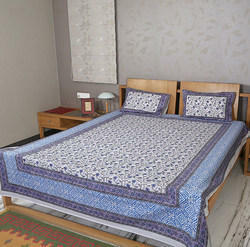 We Providing You a Best Range of block print Comforter set. This Beautiful bed sheet Has Made From experienced Craftsmen and Given a Ethnic Rajasthani Look. Beautiful bed sheet made of soft cotton cloth. Traditional bed sheet has made from experienced craftsmen. We are offering our customers an excellent quality range of Cotton Double Bed sheets. Rajrang presents wide range of Indian designer Block printed products. We Providing You a Best Range of Printed bed sheet. This Beautiful bed sheets Has Made From experienced Craftsmen and Given a Ethnic Rajasthani Look. Indian hand gold print work. 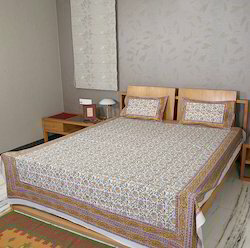 Traditional bedsheet has made from experienced craftsmen. We manufacture all kind of Indian Cotton Printed Bedding Set in variety of designs. These are available in enchanting many colors and designs that will enhance your decor. These Handmade Bed Sheet have excellent shine and smooth finish. These Bed sheets are attractive look wise and are manufactured using quality raw materials. We are offering our customers an excellent quality range of printed bed Sheet. 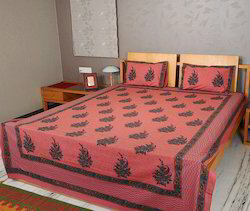 Rajrang presents wide range of Indian designer Hand block print products bedsheets. Block prints are work of India's experienced craftsmen. This Beautiful Fashion Bedding Set Has Made From experienced Craftsmen and Given a Ethnic Rajasthani Look. • Beautiful bed sheet made of cotton fabric. • These bed sheet comes with 2 matching pillow covers. • Rajasthani hand block print. • Available in many colors and sizes. Give your bedroom a placid decor with this floral bed sheets set. The hand block prints in the Quatrefoil Flora makes the cotton coverlet look serene and gives it a distinct appeal. The printed cotton bed sheet is very comfortable and soft. The quality of the fabric is good making it durable and worthy of use. The luxurious bed sheet is cozy and environmental friendly.The unique printed bed sheet comes with two pillow cover sets, both printed on one side.Gentle wash, dry in sun to avoid fading of colors. Description : Make your sleep comfortable with these tie dye double bed sheets. The elegant and the bright colors of the full-size bed sheets completes the room decor. 100% soft cotton makes it breathable and soft in feel. Dry clean only for long life and durability. The abstract modern prints make it classy for the home use. Team the cotton bed sheet with the similar prints pillow covers. 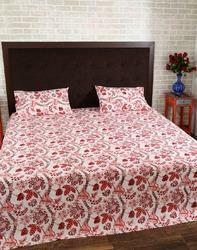 We are manufacturer, supplier and wholesaler of supreme quality range of Indian Printed Bed sheet. These Bed sheets are attractive look wise and are manufactured using quality raw materials. Our products are available in the market at industry leading prices. These products are widely demanded by the clients for their availability in various sizes and colors. Give your bed room a traditional touch with designer bed sheets. Made form 100% cotton, the bed sheet is breathable and has a soft feel. The floral prints of Leisure Medallion gives a fresh soothing appeal to the eyes. The high quality bed sheet, a perfect pick for a class of touche to your room. The fabric is strong and durable. Dry clean only for long life and bright colors. "Rajrang brings you the soft and traditional bed sheets for your bedroom. This Cotton flat sheet is soft to touch and smooth to feel. The great hand block floral prints all over the bedspread and the pillow covers looks elegant. The graceful and contemporary bed sheet that is perfect to use in the Spring and Summer season. The bed sheet brings brightness to the room. It is durable and made of sturdy fabric. You can match the bed sheet with other home furnishing accessories like curtains, cushion covers, and quilts for a finished look. Wash it gently and separately in cold water." 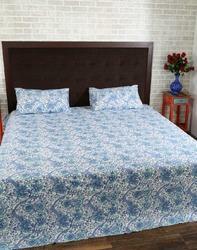 Description : Rajrang presents wide range of Indian designer Block Printed Bedsheet. These are work of India's experienced craftsmen. We Providing You a Best Range of designer Cotton bed sheet. This Beautiful bed sheet Has Made From experienced Craftsmen and Given a Ethnic Rajasthani Look. Description : Genera Online Pvt.Lmt. Our company is among the best known companies which are involved in the providing double bed sheets. These Designer Bedsheets we offer is widely demanded by the clients for their availability in various sizes and designs. They have smooth finishing and ensure classy looks. Designer Bedspread is stylish and is easy to maintain. Get your relaxed and comfortable sleep on this cotton double bed sheet. Very luxurious, soft and 100% cotton, a perfect sheet set for your home. Attractive prints and colors for summer season. Give your room a lighter decor with these luxurious bed sheets. The high quality bed sheet, with long life and durability. The hand block prints in the theme of Vivid Palampore, multi colored leaves gives our eyes a soothing feel.Gentle wash, dry in sun to avoid fading of colors. Description: We are offering our customers an excellent quality range of Hand Printed Bedsheet. Rajrang presents wide range of Indian designer Hand block print products, Block prints are work of India's experienced craftsmen. We Providing You a Best Range of hand printed bed sheet. This Beautiful bed sheet Has Made From experienced Craftsmen and Given a Ethnic Rajasthani Look. - Beautiful bed sheet made of soft cotton cloth. - Indian hand block print work. - Traditional bedsheet has made from experienced craftsmen. "Elegant printed double bed sheet with the large paisley prints from Rajrang is out to add a touch of class to your bedroom decor.This Cotton made Bed Sheets is comfortable to use, and has strong threads loomed tightly. The cotton comforter bed sheet set, with prints on top only, is safe for daily use especially in the summer season.